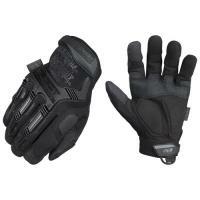 Since its racing origins with Daytona 500, Mechanix Wear has served as a reputable face in the glove industry. The M-Pact® glove is specifically engineered with the needs of law enforcement in mind. These protection wear gloves are constructed of premium materials, including Spandex for a sleek fit that resists static and Thermal Plastic Rubber (TPR) to protect fingers, joints and wrists. The combined support of XRD® and Impact Guard™ EVA foam palm provides extra cushioning and shock absorption. A sure-grip is guaranteed thanks to a lasting Armortex® coat on the thumb and index finger. The addition of a nylon cord loop attaches gloves to your person or gear and prevents loss. The M-Pact® meets TAA compliance standards.